Who's On First! What's on Second! If we add the American fuss over the recent National Aeronautics and Space Administration (NASA) changes, as epitomized in articles like "We Must Not Discard Greatest Innovator in History" from the February 27th edition of the Houston Chronicle to our homegrown Canadian fuss over the lack of an updated Canadian Space Agency (CSA) long term space plan, it's easy to forget that government space agencies with their funny acronyms and initial-isms aren't the only (or even the most important) players in the high frontier. Keeping track of them is almost like Bud Abbott asking Lou Costello about the players on the baseball team. For example, in Canada the list of government agencies with space focused activities isn't just limited to the CSA. It also includes the Department of National Defense (DND) which focuses on military space activities through its Directory of Space Development (DSpaceD) and the Department of Foreign Affairs and International Trade (DFAIT) which focuses on activities related to international cooperation and technology transfer. Of course we can't forget the role of Industry Canada, which provides background information and documents on Canadian science and technological development strategy including Mobilizing Science and Technology to Canada's Advantage (May 2007) and the Mobilizing Science and Technology to Canada's Advantage Progress Report (June 2009) which is the closest thing Canada has had to a long term space strategy since the 2003 publication of the document titled "The Canadian Space Strategy." And if you want government funding then you can't just hang around the CSA and hope for the best. You need to head to the National Research Council of Canada (NRC) which is the leading Canadian resource for R&D funding and technology-based innovation and has far more money to give away than the CSA, at least according to their website. Unless of course, you're an engineer, in which case you need to make friends at the National Sciences and Engineering Research Council (NSERC) or a social scientist who needs to go to the Social Science and Humanities Research Council (SSHRC), or a health researcher who needs to go to the Canadian Institute of Health Research (CIHR). There are, of course, plenty of others and it's also worth noting that the CSA didn't even exist until March 1989 when it was formed through the Canadian Space Agency Act. Most early Canadian space successes and satellite launches were organized through the Communications Research Centre (CRC) and even the original Canadian astronaut program was part of the NRC in 1984 when the first Canadian went into space. Of course, the above comments are not intended to diminish CSA contributions and activities which are substantial and impressive given the limited CSA budget and short period of existence. 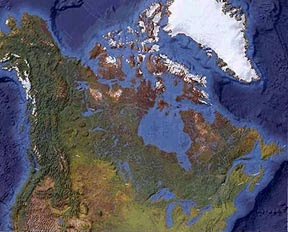 But the CSA is not and never has been the only Canadian, or even the only Canadian government player in this area. Often the mandate for these organizations overlap and while they might work together on specific projects, they also often end up duplicating each others work. A secretive military spacecraft resembling a small space shuttle orbiter flew to Florida in the belly of a cargo plane this week to undergo final processing for launch on April 19. This "secretive military spacecraft" is, of course, the X-37B orbital test vehicle, the US Air Force follow-on craft to the Boeing X-37 advanced technology demonstrator, an unpiloted demonstration spaceplane intended to test future launch technologies while in orbit and during atmospheric reentry. 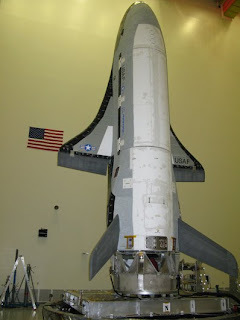 Although originally scheduled for launch as part of a space shuttle mission according to the June 2nd, 2009 article on Space.com titled "U.S. Air Force Aims to Launch Space Plane Next Year" the X-37B is now being launched atop an Atlas V rocket. It was last seen back in 2006 being test dropped from Scaled Composites White Knight. America's future in space is likely assured through various public and private programs like the X-37 and the White Knight because NASA was never the only American agency engaged in space activities. As for us, it will be interesting to see what programs surface over the next little while to move forward Canadian space activities should the present conservative government decide that the Canadian Long Term Space Plan should not be disclosed as part of the upcoming budget. Such an act will hobble the CSA's ability to develop, plan and influence their own future space activities but likely will not significantly alter other Canadian space focused activities which, much like their American counterparts, were never really dependent on any single government agency. Viable commercial space activities go back at least 50 years to the 1960's when the first Early Bird satellite was successfully launched into geosynchronous orbit according to David M. Livingston in his paper, Space: The Final Financial Frontier. And Canadian companies have always been leaders in this area. But the Canadian Space Commerce Association (CSCA), presently preparing for its 2010 annual conference on March 16th, is of far more recent vintage. The association, originally calling itself the Canadian Space Chamber of Commerce grew almost organically out of a failed attempt by a small Canadian group of volunteers to win the Ansari X-Prize for building the first privately funded suborbital spacecraft (a competition won in 2004 by US based firm Scaled Composites). The consensus growing out of that attempt was that there was (and still is) a strong need for an industry group representing smaller, Canadian based companies, entrepreneurs and start-ups seeking to understand and improve the legal, regulatory, entrepreneurial and financial environment for Canadian space and newspace focused organizations. The CSCA has always had an interesting and eclectic mix of speakers at their annual conferences (which are normally held at the MaRs Development District in Toronto, Ontario). 2008 conference speakers included Robert Richards (who spoke about Odyssey Moon, at the time a new firm recently incorporated on the then unknown Isle of Man), Burton Lee (who talked about lessons learned from his experience with the Space Angels Network raising money for space focused start-ups) and Peter Evans, from the MaRS Development District (who talked about venture capital, business plans and growth models). 2009 speakers were mostly CSCA members providing overviews of their businesses and included Robert Moru, president of A-Line Tools, Brian Feeney, president of the Dreamspace Group and Kevin Wong, senior partner at StoneCracker Scientific. Even I gave a short presentation in 2009 on the most recent Rideau Roundtable on Space where we discussed the need to develop a coherent Canadian space policy (a topic which I still write about on occasion). It will be interesting to see who ends up on the 2010 schedule of speakers, which is focused on "Our Growing Canadian Commercial Space Sector." Since I'll be attending the event (I'm one of the organizers), this is the point where I extend an invitation to my readers to attend so we can meet and compare notes. exactEarth Ltd., the data services subsidiary of COM DEV International Ltd. (TSX: CDV), today announced that it has signed a $1.4 million contract with the Canadian Space Agency (CSA) to provide space-based Automatic Identification System (S-AIS) data. exactEarth will supply the CSA with both historical data collected previously by its AIS nanosatellite (NTS) as well as with datasets to be captured at times and locations specified by the CSA through March 31, 2010. According to the exactEarth partner page, the team responsible also includes the University of Toronto Institute of Aerospace Studies Space Flight Lab, the Department of National Defence (DND), Denmark based Gatehouse A/S and the Indian Space Research Organisation (ISRO). Evidently, shy and polite Canadians are quite capable of putting together internationally capable partnerships between universities, the military, private business (both small start-ups and larger firms) and multiple space agencies which essentially mirrors relationships being developed in the United States as a result of the Obama administrations recent NASA announcements as outlined in my February 2, 2010 edition of "This Week in Space for Canada." At the Next-Generation Suborbital Researchers Conference today, Commercial Spaceflight Federation chairman Mark Sirangelo announced the creation of a new affiliates program for universities and other research and educational institutions. 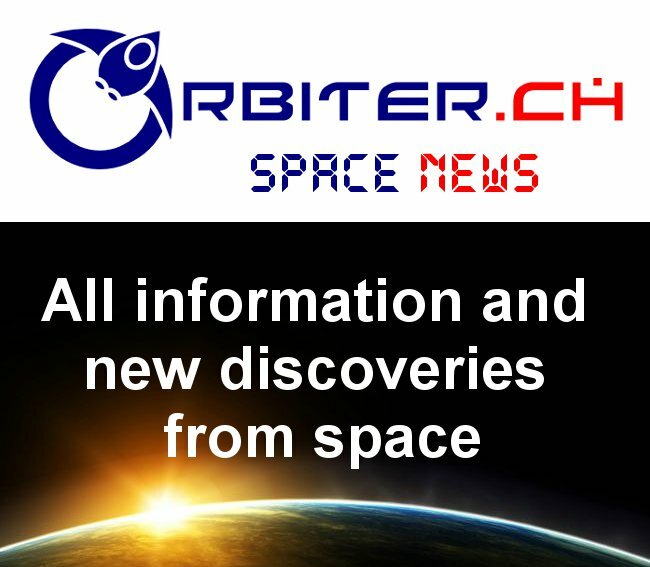 "Researchers, engineers, and educators will be among the primary beneficiaries of the new generation of low-cost commercial spacecraft, as payload opportunities to space start to grow," said Sirangelo. "We're excited to create a new category of affiliate membership to strengthen the ties between the Commercial Spaceflight Federation and the research and education community." It looks like "good old" Canadian ingenuity is poised and prepared to take advantage of this new playing field requiring collaboration and partnerships. Perhaps Americans could learn a few lessons from their northern neighbors. Feedback on "Ottawa Citizen: "Where Did That Long Term Space Plan Go?" It's only been online for a day, but I've already begun to receive interesting feedback from my February 15th, 2010 post "Ottawa Citizen: "Where Did That Long Term Space Plan Go?" The plan has been developed, and has been widely circulated amongst the main players in the space industry (I haven't seen it myself, but I'm rather off to the side of the industry at the moment). From what I've heard, Steve has followed a very extensive consultative process in developing the plan. Steve also made the point at an event that I attended a few months ago, that he would release the plan if he could, but that it is an input to the next federal budget, and hence is being treated the same way that all budget documents are: as a secret cabinet document. Hence, Steve cannot release details of the plan in public, without the permission of the relevant Ministers (in practice, it would likely take explicit permission from the Prime Minister to do this). I expect that the details will be released soon after the next federal budget is released, which I believe will be early in March. In other words, you shouldn't necessarily interpret lack of public announcements regarding a plan as indicative of lack of progress in developing the plan (although Steve could certainly say at least *that* much in public---maybe the Citizen article will prompt him to do so. The above is certainly fair comment and makes two points. It provides an indication of when the details of the document are likely to be released that isn't really all that far in the future. It reminds us that while the CSA can collect the information needed to make policy recommendations and certainly controls policy implementation, the policy must also be approved and funded at the federal government level before implementation can proceed. At some point, we might need to start talking directly to our local MP's if we really want a new Canadian long term space plan. Steve McLean is going to give a public talk at Western on April 12th - hoping we'll hear something about this elusive long-term space plan.....we'll see. With a little luck, perhaps there might be further comments over the next little while. Ottawa Citizen: "Where did that Long Term Space Plan Go?" Now, where did that Long-Term Space Plan go? Canada doesn't have one. Three such blueprints in the past have guided Canada through exciting times, during which we invented telecom satellites, built Canadarms, created instruments that measure land, air and oceans from hundreds of kilometres above, and built part of a mission to Mars. And, of course, we sent astronauts into orbit. But Canada hasn't had a new plan since 1994. Scientists and engineers now wonder: Are they supposed to work on satellites, or Mars missions, or space medicine for astronauts? According to the article, Canadian Space Agency (CSA) President Steve MacLean was given two months by then Industry Minister Jim Prentice when he was named the new president of the CSA in "the late summer of 2008" in order to write a new long-term space plan and told that "time is of the essence." Evidently, the Honorable Minister was incorrect since, according to the article "17 months later, there's no plan in sight, and no expected date for it." Readers of this blog who remember my various posts on the lack of a Canadian long term space plan (starting with the May 29th, 2009 post "A Short Backgrounder on Canadian Space Policy") should not be surprised that these issues are finally being picked up and exposed to a wider audience. Essentially, if Canada does not define a long term space plan, private business and academia will soon go about creating their own as outlined in my previous post UK & US Governments Developing Space Plans. Dr. MacLean might need to respond to these rising calls for a long term space plan soon, or else risk becoming irrelevant to the debate. Meat Loaf (born Marvin Lee Aday) was one of the iconic singers of the 1970's with his first album "Bat Out Of Hell" containing some of the most memorable tunes of that era (although he has since fallen from favor among the dwindling record buying public). One of this biggest hits on the album was the song "Two out of Three Ain't Bad." The lyrics refer to wanting and needing but not loving and suggests that "two out of three ain't bad." The UK thus joins Canada (with a much delayed update to our Canadian space policy commissioned originally when Steve MacLean became head of the CSA in September 2008 but so far not released) and the United States (with the Augustine Committee presently meeting in Washington) as essentially not knowing what to do with their space program. It's eight months along with the Augustine Final Report long released (and the 2011 NASA budget recently announced by the Obama administration) so the way forward for the US now seems clear (except perhaps for the inevitable political and economic casualties). The UK Government is already a significant investor in — and beneficiary of — Space, but it could obtain more value from its investment and at the same time use Space to deliver more services to its citizens. Space is a diverse sector resilient to fluctuations in economic growth; it has high growth potential, it produces advanced technology, has low carbon credentials and strong scientific foundations. The UK should, therefore, allocate a disproportionately higher share of industrial funding to capitalise on the opportunities for growth that Space offers. We are at a crossroads in terms of the strategic direction for the UK. The UK’s share of the world Space market in 2007 was around 6%. This substantial figure is about twice the size of many other major UK industrial sectors, but less than that of our leading industries. However, if we take a positive decision to go for growth, we can raise the market share significantly. But, if we fail to step up our efforts there is a strong likelihood that the sector will slide back to around the 3% mark. This might prompt the departure of some of the large multi-nationals which have chosen to invest in the UK’s Space sector. It would certainly wipe out much of the UK’s past investment in intellectual capital with a consequent loss of our existing strengths. The statement that a lack of government support could result in "the departure of some of the large multi-nationals" suggests interesting parallels to the aborted sale of portions of Canadian based Macdonald Dettwiler and Associates (MDA) to American-owned Alliant Techsystems (ATK) in April 2008 which highlighted national security issues and economic infrastructure components the UK committee is obviously familiar with. It's also interesting to note that both the US and the UK reports have focused on developing a "space industry" rather than a government operated, funded and traditionally styled "space program." As well, while these reports seem to have been both "wanted" and "needed" in their respective jurisdictions, there seems to be little love attached to them because of their focus on commercial space issues. Whatever the parallels, these respective UK and US committees have acted and presented at least some indication of a way forward for space focused activities in their respective jurisdictions. Like the song says, two out of three "ain't bad." Unless perhaps, you're a Canadian space focused company, scientist, engineer or advocate waiting patiently for CSA President Steve MacLean to release his report. Our space focused "way forward" still hasn't been released and isn't expected to be until later this year (at a date, still to be determined). Canada could also use a way forward and while we might not see our space focused industry shrink like the UK document suggests is possible (and my current edition of "This Week in Space For Canada" indicates that the opposite could be happening) we should note that it's always a useful activity to plan ahead, whether you're managing a household budget, planning R&D expenditures or running a space agency. Meat Loaf is expected to release a new album this year (his eleventh). Lets hope the CSA is as diligent with releasing their policy document. The following speakers have confirmed their attendance at the Canadian Space Commerce Association Annual Conference happening Tuesday March 16th at the MaRS Discovery District in Toronto Ontario. Wilfred So, a Patent Agent with the Intellectual Property Group at Blake, Cassels and Graydon LLP.will be speaking on the topic of "Protecting Any Invention under the Sun and Beyond – The Basics of Patents and Their Role in Space Activities." Mr. So's background includes R&D for landing gear, life support systems for the F-22 Raptor and visual inspection equipment for the Canadarm. He was also exposed to various other industries in a consulting role, including tire manufacturing, production of heavy tractors, textile manufacturing, chemical production and electrical turbine production. Dr. Wade Cherrington, a physicist and consultant in the fields of computer-aided engineering and scientific computation working with Continuum Aerospace and their computer-aided engineering division, Continuum Simulation & Design will be speaking on the topic of "The Evolution of Computer-aided Engineering for Aerospace." According to Cherrington, virtual prototyping through simulation-based design is a powerful tool for creating great products in less time, and this is particularly important in designing for aerospace and space applications. In his talk, he will describe some of the practices developed at Continuum Aerospace for achieving an appropriate mix of commercial and non-commercial tools in the simulation work-flow, with a view to achieving the greatest impact for a given budget. He'll also provide an overview of current limitations and some exciting new trends in simulation-based design that promise to be transformative in the years ahead. More speakers will be announced shortly. For more information on the event please check out the website at http://spacecommerce.ca/agm2010. Feedback on "The Men Who've Sold the Moon." Daniel Faber is an ex-president of the Canadian Space Society, an ex-employee of one of the finest small suppliers of hardware, software, training and expertise to the spacecraft community (Canadian based Sinclair Interplanetary) and, as near as I can tell, also an ex-Canadian since he recently returned to his Australian home to work on their changing space program (some of those changes are discussed in the ASICC Newletter #1 for December 2009, published by the Australian Space Industry Chamber of Commerce). So now that we've made a list of his "exes" we should perhaps also note what he is one of the most knowledgeable and thoughtful upcoming amateur experts on the potential economics likely to surround our new space age. Even Alexander the Great, on learning that there are countless orbs in the universe, wept saying "Do you not think it a matter worthy of lamentation that when there is such a vast multitude of them [worlds], we have not yet conquered one?" (Pultarchus, c. 46-120, IV). Dennis Hope is only the most recent/successful in a long and growing list of people purporting to own and/or sell the moon. An excellent review of the legal aspects of this practice is given by Virgiliu Pop ("Who Owns the Moon? Extraterrestrial Aspects of Land and Mineral Resources Ownership", Space Regulations Library, Volume 4). His list of claimants to the moon and other celestial bodies includes A.D. Lindsay (USA, 1936), J.T. Mangan (USA, 1948), the "Elves', Gnomes' and Little Men's Science Fiction, Chowder and Marching Society" (USA, 1952), J.G. Vera (Chile, 1953), Planet Mars Development Corp. (USA, 1954), R.R. Coles (USA, 1955), Japan Astronomical Society (Japan, 1956), Oklahoma City Council (USA, 1965), Deer Park City Council (USA, 1965), 35 citizens of Geneva (USA, 1966), and Dennis Hope (1980). Today I , Daniel Faber will also claim the Moon. Therefore, as per my decree, on this date in the year 2010, it is mine! But of course, my claim changes nothing, just as most of the previous claims to the Moon have also changed nothing. Anyone of us can claim anything we want but a simple claim all by itself doesn't necessarily make it so. For example, I could claim the television in your living room. Unfortunately for me, your own claim to that television can be backed up by the courts and the police, and you can exclude me from using it. This is what Dennis Hope and other would-be owners of celestial bodies are lacking - a court with jurisdiction over the territory, backed by executive powers (ie. police) to enforce those decisions. The 1966 United Nations Outer Space Treaty, by prohibiting national appropriation by any means, effectively prohibits the courts of any country from having the jurisdiction to hear the case. As outlined in Virgiliu Pop's book, the treaty defines the Moon as belonging to "everyone and no-one" with the UN possessing the legitimacy and soft power through the Outer Space Treaty (and it's signatories) to allow for any nation to defend it's "rights" as defined in the treaty in UN sanctioned international courts. So everyone, and not just Dennis Hope, can use the Moon, and can change it in any way, but they can not restrict others from using it. Importantly, anything extracted from the moon, such as rocks or minerals, can be treated like fish from the sea and become the property of whoever extracts them. You can mine the moon. You can operate a business. You can own your equipment and the things you extract - just not the real estate itself. This community ownership has a definite appeal. We all own it and we can all use it! However the world is never quite so simple, and our well being is not so easily served. A lot of effort is needed before things returned from the moon start improving people's lives. For example, at present, if you wish to raise a couple of hundred million dollars to characterize an ore body on the moon and prepare a mine plan (not an unusual price for such activities on the earth, before starting to construct a mine), you have no guarantee that someone will not jump in and build a mine on that spot while you are still trying to raise the necessary billion dollars or so to build your own mine. You can't hide something on that scale - everyone will know where the riches are. The usurper's business plan will look much better than yours, having saved those hundreds of millions of exploration costs. If I were an investor I know where I would put my money, and no court in the world could help you. The result is that you will never get the hundreds of millions for the initial exploration. So as presently structured, the only funding that will go into mineral exploration on the moon under this regime will be from governments and philanthropists. Progress will be painfully slow. Contrast this with most countries on Earth where the government grants exclusive mining rights to get investment happening, thus creating jobs, collecting taxes and keeping the price of metals low around the world. Thankfully history has a number of examples that show how the implementation of appropriate ownership rights over a communally owned environment can effect this process. For example, the "Inclosure Acts" in the UK in 18th and early 19th centuries gave exclusive farming rights to individuals in what had previously been a communally owned environment. This meant that the traditional rights that all people once held to graze animals on these areas were denied. However, the incentive to the remaining farmers to improve their lands through drainage, cropping and management resulted in an explosion in agricultural productivity, reducing hunger and associated illness and allowing the population of Britain to increase 5 fold in 100 years. Similarly in 1975 in Sichuan, China, the assigning of production contracts to individual households (which disband the previous existing commune system) led to a 25% increase in agricultural output within three years and an abatement of the famines that had devastated China in the preceding two decades. All the data supports Benjamin Franklin's assertion that "Mine is better than ours". This is the economic reality produced by the legal reality. Every country in the world now subscribes to the capitalist system as the most efficient method of improving the economic well being of its citizens. This system requires the creation of "mini monopolies" to justify using up the resources (ie. cash) needed to make those improvements. The size and duration of the mini-monopoly needed to "incentivize" investment is commensurate with the risk and the size of the investment; typically twenty years for technology (patents), greater than a generation for farming, an indefinite period for land/ buildings and "until you stop exploring/mining" for minerals. These are the legal and economic mechanisms, the organs and the "warts" that make the system work. We are comfortable with them in our own countries and our own backyards. Expanding our economy to the higher orb, warts and all, will bring benefits we have not started to imagine. The cat is finally out of the bag with the Monday release of the Obama administrations budget proposal for FY2011 and various Canadian pundits and self appointed experts have already begun to weigh in on whether the changes are good news or otherwise. Kevin Shortt, President of the Canadian Space Society in a CTV News interview (available online at http://watch.ctv.ca/news/#clip262388) said that "we are at day zero" of the new budget and the winners and losers are still to be determined while York University astronomer Paul Delaney, states unequivocally that Canada's space program is "looking for a quick right turn towards the Europeans" as a result of the budget (his CTV interview is available online at http://watch.ctv.ca/news/#clip262148). Global National News ran a short piece quoting from a variety of sources (including a seven second clip of me) under the title "Obama's deficit plan cuts NASA funding" during their February 1st National Newscast while Canadian Press author Peter Rakobowchuk discussed how the "Canadian aerospace industry says Obama budget presents a great opportunity." The Rakobowchuk article, perhaps the most comprehensive in the Canadian mainstream press, includes comments from Claude Lajeunesse, CEO of the Aerospace Industries Association of Canada ("a great opportunity for Canadian companies"), Carole Duval, a spokesperson with the Canadian Space Agency (who is quoted as saying the agency is reviewing the Obama budget and will speak to NASA "to see how we can work together on these initiatives), Christian Sallaberger, VP and Director of space exploration at Macdonald Dettwiler and Associates (who says his company "can definitely support the plan.") and even me again (I think I'm becoming a pundit). The general consensus (mine included) is that Canadian space focused business and the CSA are well prepared for what's happening in the US. But what about Canadian scientists and science policy makers? After all, a lot of the science we do in Canada is in cooperation with others and some of those people (especially in space) are Americans doing work for NASA. Are scientists and policy makers in Canada prepared for that "quick right turn toward the Europeans" as predicted by Paul Delaney? Evidently they're not. Perhaps the only disappointment over the last few days is the complete lack of editorial comment in science focused media such as the Science Canada blog, the Science Media Centre of Canada (SMCC) website or even the science policy news section of the Canadian Science Policy Centre (CSPC). The SMCC hasn't had an update since December 15th 2009 (just after their appointment on December 9th of "veteran science journalist Penny Park as the inaugural Executive Director") so maybe it's unfair to expect much from them but Science Canada blogger Jeff Sharom has been posting stories every couple of days to the site since the site went up and it seems logical to provide at least some commentary on stories he's already posted such as "Obama to cut NASA's Moon Plan" and "NASA to Explore Private Space Flight." Of course he's just a grad student so perhaps we shouldn't be too harsh even though his lack of voice is typical of the Canadian science focused blogsphere. But the biggest disappointment simply has to be a total lack of any kind of coverage whatsoever in the science policy news section of the CSPC. The site (which grew organically out of the 2009 Canadian Science Policy Conference) doesn't even mention the changes at NASA or how this will effect hundreds of researcher presently working under CSA contracts or for other major Canadian players who subcontract to NASA or other US firms involved in space focused activities. As well, there seems to be no articles or discussions anywhere of the international collaborations and partnerships required to undertake large scale science (an example of which is discussed in my article "Thirty Meter Telescope Awaits Construction Funding"). Actually there are no discussions anywhere on the site since the discussion forums are offline, awaiting the transfer "of all the old discussion topics from our previous website to the newly redesigned website." These are obvious errors that the people interested in science policy in Canada should be addressing. As a child growing up in Winnipeg Manitoba, one of my fictional hero's was Delos D. Harriman, the Robert Heinlein character in the novel "The Man Who Sold the Moon." 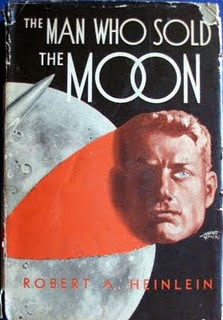 Written in 1949 and published in 1950 it tells the story of the first (at that time fictional) landing on the Moon by private companies controlled by Harriman, "the first of the new robber barons," who is determined to reach and control the Moon. He tells his business partner he "would cheat, lie, steal, beg, bribe — do anything to accomplish what we have accomplished." His determination was rooted in a childhood desire to travel to the moon himself, but the responsibilities of running his financial empire make this dream impossible (at least until the sequel, "Requiem"). I never thought I ever meet a person who actually raised money selling the Moon but that was before I heard about Dennis Hope and his Lunar Embassy. Hope has been selling deeds to small parcels of land on the Moon since 1980 based on what he perceives to be a loophole in international law allowing him to claim full sovereignty of the moon as an individual (countries are specifically forbidden from claiming the Moon under the 1967 Outer Space Treaty, which was ratified by 98 UN member countries, including the United States). Hope estimates that he has made $9 million selling one acre lots of land in outer space and claims that he, alone, has the legal authority to do so. He figures that the UN and other appropriate world bodies would have contacted him by now if he was doing something illegal, but no one has. Only time will tell if his figuring is correct but at this point his views may or may not carry as much weight as those who attended the Space Security Index 2009, focused on the "Status and Future Trends in Space Security" at Canadian Embassy on January 21st. The event, organized by the Secure World Foundation (SWF), the Space Security Index (SSI) and the Canadian Embassy in Washington focused more on describing the way the world "is" rather than explaining to us any emerging "future trends." the health of the satellite manufacturing and services industries and the launch industry that feeds upon them. He pointed out that these industries seem immune to the current global economic crisis, though he did mention that recent cancellation of a key U.S. military communication satellite program, continued strict application of International Traffic in Arms Regulations (ITAR) and a reemergence of artificially low Chinese launch prices will have negative impacts on the space industry. This might be a reasonable list of statements on how things are but it's certainly not comprehensive and it's not in anyway a list of suggestions on how things are going to be. Plus, even as a statement of how things are, major players are missing including RSC Energia, new players Space-X and Virgin Galactic or any of the two dozen plus private spaceflight companies currently offering or planning to offer equipment and services geared towards spaceflight, both robotic and human spaceflight. In essence, the Secure World Foundation has simply forgotten about a whole subset of growing space focused private industry that it needs to include in order to discern accurately any emerging trends in space. It seems obvious that international experts are not only ignoring people like Dennis Hope who continues to sell pieces of the Moon to anyone looking for cheap land off the beaten track. They've also forgotten a whole bunch of real life future Delos P. Harriman's, presently running firms offering or intending to offer spaceflight related services. Here comes the next great historical wave of "robber barons."